Rated: PG-13 for war-related and horse-related violence. The usual argument that someone will come across when discussing the work of Hollywood blockbuster and box office king Steven Spielberg is that he’s a sentimentalist. His success, whether in terms of gigantic spectacle (Close Encounters, Jurassic Park) or serious drama (Schindler’s List, Munich) is that in the end, he’s somewhat of a pushover when it comes to trying to break through to our emotions, often going right for the artery in trying to activate our tear ducts. Certainly one can simplify what Mr. Spielberg does by that word, but I’ve always read it as something more complex. Instead, the filmmaker believes in the power that good can sometimes triumph over cynicism, often in the darkest of times. That if we believe, than realism need not matter, and the bonds we hold—between family, friends, or perhaps even strangers—are all we need. These themes run throughout the veins of War Horse, Mr. Spielberg’s second feature this holiday season (after his animated Adventures of Tintin). 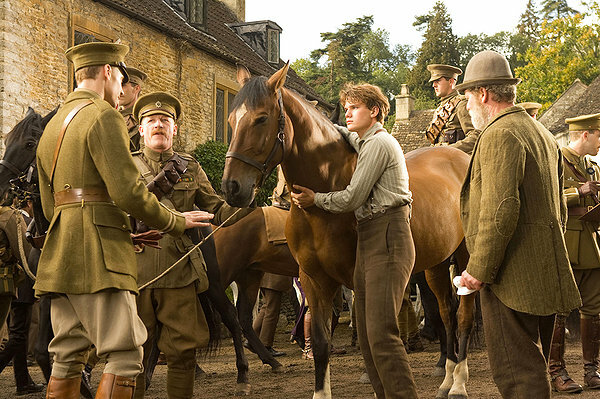 Adapted from the novel by Michael Morpurgo, though perhaps sent into production after the runaway success of the London stage adaptation now playing on Broadway, Mr. Spielberg’s narrative follows a titular horse from its trials with a poor family in the United Kingdom, before weaving through a number of stories during the First World War. 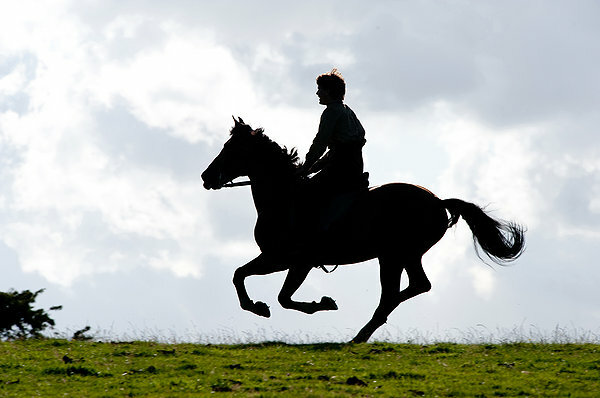 Mr. Spielberg has always asked us to sympathize with the oddest of creatures, even aliens (ET) or androids (AI), and no doubt his filmmaking and use of the camera is what best puts us inside the mind of Joey, a young horse and friend to Albert (Jeremy Irvine). Albert lives with his parents (Peter Mullan and Emily Watson) on a small farm, where they struggle to make ends meets, and the first third of the narrative involves the naïve Albert trying to teach Joey how to plow. Soon enough though, Albert disappears as Joey is sent off to war. Following a narrative similar to Anthony Mann’s Winchester ’73, screenwriters Lee Hall and Richard Curtis follow Joey around as sort of a guide for a number of stories surrounding the war. There’s the English captain (Tom Hiddleston) hoping to prove himself worthy of his position, the two German brothers sworn to protect each other, even if it means abandoning the war, and the young French girl (Celine Bickens) who wants more than nothing than her grandfather (Niels Arestrup) to let her know the truth about her parents, but more than that, find some sort of happiness amid the terror. Joey becomes our narrative through line, and it is his presence that often instigates a change in the more cynical characters to give into the power of something greater than themselves. These little vignettes give War Horse a somewhat awkward rhythm, especially considering how long the first third of the narrative spends on our two heroes Joey and Albert. And as good as some of these vignettes are, especially one involving an English and German soldier helping Joey break out of some wires, they feel like variations on the same theme, each one attempting to chip away at your heart and tear ducts. There’s nothing wrong with Mr. Spielberg’s sentimentality, but the lack of variation in the story feels tiring over time, especially given the film’s two and a half hour running time. But no one can deny the power of the director’s filmmaking style. Owing more to John Ford than the director has done in any of his previous films (the film’s silent ending, with its Technicolor looking sunset, borrows heavily from The Searchers), Mr. Spielberg goes for glossy and gigantic camera sweeps and deep close-ups than almost look past the faces and into the characters’ souls. Because this is less a war film than a film that includes war, the battle sequences go for spectacle and intensity without the ultra-violence of Saving Private Ryan—a surprisingly effective method that still gives the audience a jolt. Mr. Spielberg makes the battles tough to watch, but it is the gut wrenching moments waiting in the trenches before that his camera makes you squeeze your seat with terror. War Horse is certainly is a softball looking to tear down your emotional barriers, and certainly its climatic ending will lead more icy viewers to scoff at its realism. But Mr. Spielberg has never set himself in the real world; his cinema wants to not only transform us by bringing us to worlds and places we could never see, but also a place where, perhaps, just for a few moments, man can overcome his skepticism, and give into the power that humanity may have inside.